Handpainted Fabric for a Game of Thrones Costume « Adafruit Industries – Makers, hackers, artists, designers and engineers! When you can’t find the specific fabric pattern you need, you can always make it. 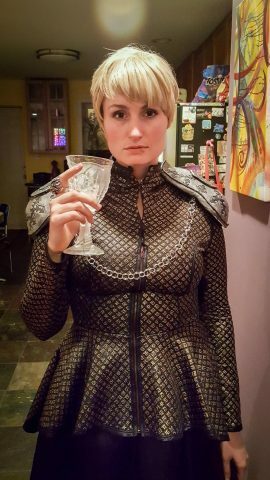 Redditor NeverNix shared a photo of his friend’s detailed Cersei Lannister costume from the end of season six. She made the costume over the course of a month, and that’s particularly impressive when you consider she painted every square onto the jacket by hand. It’s an incredibly detailed design, and though it seems like it would be easy to make a mistake, the pattern on the front of the jacket looks perfect. She also made the pauldrons by hand with foam covered in air dry modeling clay.